Social networking has grown vastly in size over the past few years. Although we see it as just an every day tool that we rely for someone who is new to the term it can be quite confronting. The open ended nature of social networking can be described using an example like high school. A student may have quite a few friends within the school who also have other friends. The chain goes on and this is how you create a social network. Social networking websites such as facebook use this idea with web based technologies that allow users to add friends and interact with one another. A new upbringing is the use of social media within the enterprise. Companies all around the world are using these technologies for internal and external communication. Communication – Almost all social networking sites have a chat bar which will help employees contact one another on a medium that may be more enjoyable than the usual email. Viral Growth- Social networking grows rapidly so once the chain reaction begins the opportunity available for advertising and brand making. Communication- Allows communication with public member for reviews and customer feedback. Advertising is an important aspect with Social networking websites such as Facebook. you can promote who you are as a business through the use of viral marketing and show the public what is is that you are offering. IGC can use this technology to promote the conference and give a list of upcoming dates. Content on the social networking website has to be kept interesting to keep people interacting with your page. This can be done through the use of keeping information modern and filtering any junk that is on the page. Use of pictures and easy to read post will also help with this. Social networking sites such as Facebook and twitter allow the user or in this case organisation to send friend requests to other people within the network. By the use of viral growth a simple few friends can turn into a large community supporting your page and the content involved. For IGC to accomplish this successfully it would need to aim for it target audience and kick start the chain reaction of the community. Strategy 4 – Engage Community. Engaging the community is one of the most challanging tasks with social networking. It is reletivly easy to build a community but to keep the users engaged is a more challenging task.This can be accomplished through the use of engaging media on the organisations page such as surveys and questions regarding to the IGC. For example a question could be brought up about topics for the next meeting. As can be seen by the above I strongly agree that the push of social media and web 2,o tools will increase company;s involvement with the public and help them grow as a community. The consumer technologies discussed throughout my blog so far such as social media and bloging form the foundation of how the world and businesses rely on web 2.0 technologies. It is transforming how we communicate and work. Wiki’s are web 2.0 technologies and are used quite similarly to blogs. Before I discuss the in depth use of wiki’s I will first clarify the basics of a wiki difference between the two. For starters what exactly is a wiki? A wiki is a piece of server software that allows its users to create and edit data via a web browser. It is a real time tool therefore can be used as a means of collaboration. It is unique with group communication mechanisms in that is allows the contributions to be edited in addition to the content itself. Blogs are user controlled, internet readers have access to this media but are unable to edit or in some cases even comment. Wiki is open and does not suppress any users input. Wiki can be commented and content can be edited. Wiki does not have to be reverse chronological order, whereas a blog does. Wiki’s have grown largely over the past few years, so much in fact that finding information about them is hard as every search with the term wiki brings up thousands of online wiki’s available to us online users. This technology has the potential to transform how IGC (International Geological Congress) members come together within the organisation and address their company wide objectives. Information being lost due to such relaxation of editing rules. A moderator to manage all information and filter through junk or repeated topics. Backups to limit loss of data. I believe that the use of a Wiki within almost any organisation will be beneficial and I have breifly outlined how I believe it could work with IGC. Even though there were some issues there was simple and manageable fixes for all of these. According to HubSpot a massive 75% of the responded blogers, class a blog as being useful followed with 31% who voted it as being critical for their business. External Blogs can assist most companies with increasing consumer knowledge about the product as well as sales, ratings, and offers. Internal blogs are only visible from inside the company and assist in employee engagement as well as knowledge of tasks going on around them in the workforce. Internal communication – can be used as a portal for updates news, etc. Internal corporate blogs should incorporate all employees so every one is updated on other employees stages of work. It is hard to show examples of these due to internal blogs usually only being accessible within the company. The company can view what is being said about them and give their pointr of view. Viral marketing – Self propagation of your marketing message, leading to exponential growth. Information – Consumers look to the internet for advice and talk about what they like and dislike. This gives the company a chance to give their side or embrace the community support. Two great examples of these include Telstra and Realestate.com. Telstra use their blog to communicate with customers and shareholders giving them updates with new products and deals hitting the market whereas realestate.com use the blog as a means of advertising the latest deals. The Australian Geoscience Council Incorporated (AGC) is the organising body responsible for the 34th International Geological Congress. The AGC is the Council of Presidents of the major Australian geoscientific societies and is the peak representative body for the 7000 geoscientists in Australia. Aims and objectives of the company? The challenges preventing this from happening? – How to make more people aware of the event and bring in a larger crowd. 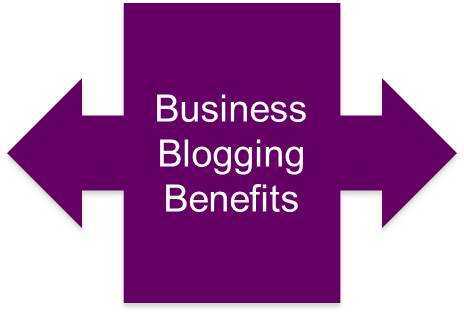 The use of simple blogging and micro blogging technologies can be useful to address these problems shown above. It will help the communication between people and provide information for upcoming events. Also meeting summaries can keep the public and members up to date with what is happening within the organisation. Kaplan Andreas M., Haenlein Michael (2011) The early bird catches the news: Nine things you should know about micro-blogging, Business Horizons, 54(2). Return on Investment (ROI) is “A performance measure used to evaluate the efficiency of an investment or to compare the efficiency of a number of different investments.” ROI in enterprise 2.0 can be used to calculate the return on investment of incorporating social media and web 2.0 technologies. Return of investment can sometimes be a difficult concept because there are always risks with employers not trusting the use of enterprise 2.0 in there corporation such as giving all users access to social media tools like facebook. It is also quite difficult to measure return on investment having to calculate both sides of ROI being the cost and the return. ROI is calculated by subtracting the costs from the gains of the investment and dividing it by the cost to achieve a percentage. The trouble lies in working out what the costs and returns are including putting these into quantifiable data. Software – Platforms that allow the business to incorporate enterprise 2.0. This may include sharepoint software and other licenced products. Hardware – Servers to support the software if needed. Lag in Activity – Once the technology has been installed there will be a down time before it achieves its full functionality. Training – Training of employees to use the web 2.0 technologies. Before a company implements enterprise, to incorporate ROI they should establish their expected benefits from the implementation and the cost they are willing to pay. if customers are important and there are more that 800 million active users on facebook isn’t it clear that social networking can help build client base. Instead of just introducing a technology such as wiki start it up and use it and test it, apply it to a specific area and see if it increases productivity. The main way to calculate the ROI in enterprise 2.0 is by working out the time saved by implementing the product and calculating this into how much money is saved. This data is usually shown through a graph depicting the money saved over time. A further way to measure the ROI is from the point of view of sales. The implementation of web 2.0 technologies may increase the rate of sales which can be used to calculate the change in profit. In my previous blog post I discussed the good and evil incorporating Enterprise 2.0 within a company. I discussed benefits such as knowledge , reputation, staff engagement, productivity, efficiency and risks including security, loss of control, resources, productivity, reliability and reputation. Although we discussed these in quite some detail we did not talk about the legal risks involved with enterprise 2.0 in particular with social media. These risks can be apparent to both employees but also members of the public. I would like to acknowledge before I start that I have no qualifications in law and this information is just commentary on my personal understanding of the legal risks. Some legal risks of enterprise 2.0 include copyright, defamation, negligent statements, and reputation; which are all quite self explanatory. The main objective company’s face to outlaw these risks is the creating of a social media policy. Some further information regarding social media policy can be found in the video provided. The two main social media tools this company uses in Facebook, Youtube and Twitter. They have made themselves very know to the society through these and it has been seen as quite a success. Although the legal risks involved with this could include plagiarism through copyright, privacy breaches and defamation. Copyright can an issue involving both the employees and the public. Due to the use of so many social media sites employees may upload audio/video or written content that is sensitive to the public thus breaching copyright policy’s. As well as this the public may use the information given from the media sites in an ill matter infringing on copyright yet again. Due to the use off many social media site as shown above there is ways that employees or public members can post private data thus defaming the company. Due to the company being such a large organisation thus giving it many competitors this could be quite threatening to the company’s reputation. Not only this but false reviews through the use of commenting on external social media sites as well as their own may damage the company’s reputation. Although it is very difficult to suppress all the possible legal risks out there the company’s social media policy should protect it from many penetration attempts into its legal security. Why does an organisation need a social media policy. We will further investigate the benefits and risks of the increasing use of enterprise 2.0 and the influence this is having. The rapid growth of enterprise 2.0 within the workplace has been obvious through the use of social media tools such as Facebook, Twitter and Youtube. The use of these social network sites are a great form of advertising brands and increasing the communication with customers and also within the company. 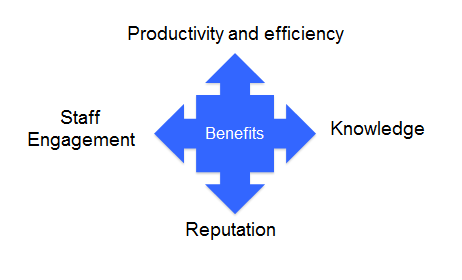 Key potential benefits of implementing enterprise 2.0 include knowledge , reputation, staff engagement, productivity and efficiency. There are many benefits available for companies to merge with Enterprise 2.0 and once they have embraced the technology they will not want to go back. Allows for a faster better outcome, streamlining communication through online communication. Social networking can benefit because as humans we work well in a team and having this link of formal and informal communication will help the employees work around each other, enhancing trust building and teamwork strategies. 20% actively disengaged – people who are not engaged in their work but also disrupting others. 18% engaged – People who love their job and are fully engaged in what they are doing. When you hit hurdles within the workforce you need people who are engaged to tackle these hurdles and continue on with their work. Enterprise 2.0 helps the outcome of this by allow easy interaction with what is needed through tools such as Intranet and social media within the office. Knowledge & Reputation – 2.0 technologies uncover people’s knowledge by allowing input into a wider range of work options through use of social networking and open office technologies, such as a group wiki. It allows people to express their opinions and for organisations to source information from the public. This was done by the UK’s National Health Service (NHS) Orkney where due to an enormouse amount of emails being bounced back and forward updating files the company decided to use a hybrid blog and wiki platform to offload from the email traffic and alow easier communication throughout the company. Also increased visibility can be used through use of social media techniques to advertise your market. Everyone uses there technologies including all levels of government to express their opinions. Key risks and concerns of e2 implementation include security, loss of control, resources, productivity, reliability and reputation. Security – Information loss can be leaked through social media whether the company supports enterprise 2.0 technologies or not. The weakest link is the employees as they have many devices to access enterprise 2.0 technologies available to them. Take for example if you have a falling out with someone at work and post it on Facebook dishonouring the person. This could be commented on by an employee at the same company, and their friends of friends may see this linking it to the affected employee creating a breach of workplace policy. Network security can also be an issue through the use of open source programs, websites with poor reputation and email. These can all infect employees computers with spy ware and viruses which can be spread throughout the office. Loss of control – Say a company creates a wiki open to the whole organisation for widest input, users with little knowledge about the topic can input false information which can be spread around the office and lead to further complications. The more engaged staff the larger the input but the larger the security risks. This can also cause conflict within the office when employees have opposing views. Reputation & Reliability – You can damage reputation of employees through social media sites for example an emplyee uploading inappropriate photos to a public social media site of the company’s Christmas party. Customers can openly complain about employees or serves trhough the use of comments. Whether the comment is true or false the best way for the company to rebound from this is to respond publicly. 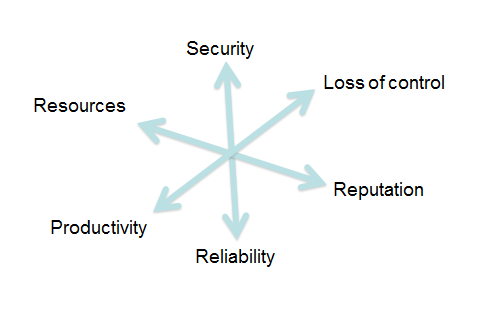 Productivity & Resources – Although productivity may be a benefit within enterprise 2.0 it also has its complications. If social media is allowed within the organisation it may distract people from their work and not help them grow in the workforce. The main perpetrator to this is an un-engaged employee. The issue with resources and enterprise 2.0 arises when employees may stumble upon wrong information online or possibly plagiarise information from an external source. This can be done easily through use of social networking. You cant avoid these risks by removing enterprise 2.0 from the workforce as employees will do it themselves through use of phones and personal computers. The company is better off supporting it within the workplace and monitoring it effectively to maximise growth within the organisation. Also, through the use of a ‘social media policy’ the company can limit the use of many ill treated web 2.0 technologies. Dell – Dell using twitter and social networking to sell and advertise products. Belkin – one of its employees attempted to use Amazon’s crowdsourcing service, Mechanical Turk, to generate positive online reviews for its routers. 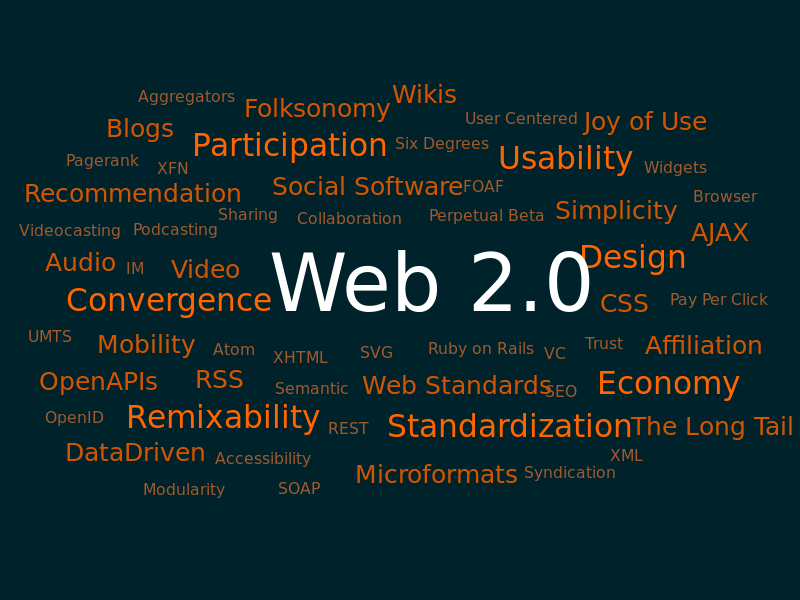 There are plenty off web 2.0 tools availible to us in this modern society to help with personal production. These include: wikis, social networks, Twitter, blogs, rss, social media, taging, podcasting and any further interaction and communication with the Web. Social networking is probably one of the largest growing within recent years and support a majority of the worlds population. Almost every person with access to the internet involves themselves in some sort of social networking. These tools among many allow users to interact with one another no matter where they are throughout the world. All that is needed is access to the internet and technology that supports web 2.0. Information is available to users at a click of a button and users can give their own opinion through use of commenting and blog sites. Media such as news and weather is also available at the click of a mouse revolutionising the world and how it works. I went further into analysing a web 2.0 tool called google latitude which allows users to keep up to date with where there registered friends are. This tool allows the user to update there GPS location whether it be on there computer or a relevant SmartPhone. They can then add friends and allow them to view their current location. Found this tool to be quite amazing in how much the internet takes over a majority of our lives. We cant even leave our house without the internet following our every move.